Going into the new Standard format after the rotation to BREAKthrough-on, there had been a mostly set meta game that players have been expecting. Decks like Gardevoir GX, Volcanion EX, Metagross GX, Vikavolt, Golisopod GX, and Greninja were expected to keep seeing play after seeing some success in the later portions of the season. For the most part, most of these decks didn’t appeal to me as being particularly fun to play, with the exceptions of Volcanion and Golisopod, although I didn’t quite have a list I was happy with for Volcanion and had some concerns about Golisopod. 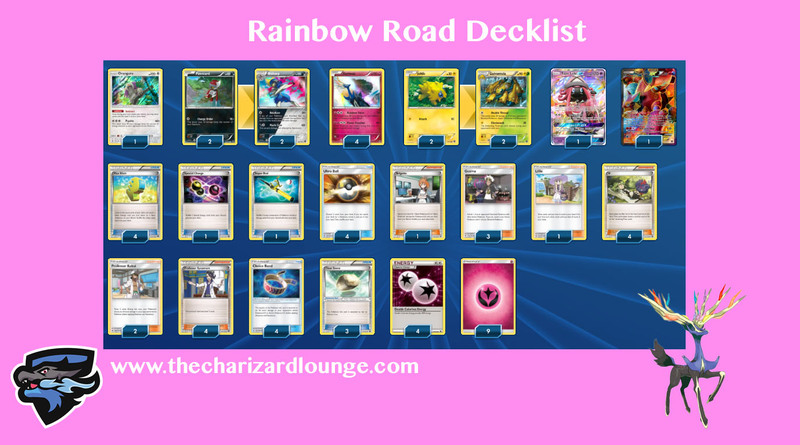 As I wanted to find something I could enjoy playing in Standard, I scanned over the available card pool looking for alternative ideas of decks to build, and Rainbow Road was one of the decks that technically had survived rotation, but which also has been mostly ignored. It was being ignored for a good reason, previous builds for the deck were fast, utilizing Hoopa EX, Shaymin EX, and Sky Field to quickly establish a field. With the exception of Hoopa EX, all of those cards were lost to the rotation. While the EX variant of the deck had been the superior version last format, with more limited bench space, the dual type evolution based variant of the deck became the only viable build for the deck. With GX Pokemon having up to 250 HP, you really need to have multiple dual types on your bench if you hope to take OHKO’s against these monstrous GX Pokemon. If you’re not hitting OHKO’s with this deck, you’re going to be losing most of the time. I ended up playing this for our first League Cup of the season, which had 60 players and was played with best of 3. The tournament was roughly the size of a medium sized State Championship from a couple years ago. If they keep being this size, or perhaps even bigger, League Cups will be a very gritty fight for points all year. My matchups at the tournament were: Tapu Koko/Necrozma GX/Marshadow GX Spread Devolution (2-0), Golisopod GX/Garbodor (2-0), Golisopod GX/Garbodor (2-0), Metagross GX/Solgaleo GX (0-2), Alolan Ninetales (2-1), and Vikavolt/Tapu Bulu GX (ID). Then in Top 8, I lost to fellow Charizard Lounge writer Conner LaVelle, who was playing Turtonator GX/Ho-Oh GX/Volcanion EX. In this article I will go over my list for Rainbow Road, some alternate card choices that you can consider depending on the meta, and give my thoughts on the primary matchups of the format. 4 Xerneas BKT – This is your main attacker so you want to max it out. Typically you will be playing with two of these in play, but depending on the matchup and your board presence you might be able to have three on your field and still hit the damage numbers that you need for knockouts. You will almost exclusively use its Rainbow Force attack, which is the primary purpose of this deck. It takes two attachments (a Fairy and Double Colorless Energy), so you will either need to manually power it up across two turns or get a Fairy Energy onto it through a Max Elixir. Once powered up, Xerneas is one of the most powerful Pokemon in Standard, being able to OHKO everything under the right conditions. Alongside Xerneas we play all sorts of dual type Pokemon to boost its Rainbow Force damage. Rainbow Force does +30 damage for each different type on your bench, so we want to fill our bench up with as many types as possible to maximize its damage output. 120 HP is a little bit on the low end for the current format, so Xerneas will be knocked out in one hit itself in most matchups. This is primarily played because of its Grass/Lightning dual typing, allowing you to get two different Pokemon types out of a single Pokemon line. You are able to use its Double Thread attack, which snipes two Pokemon on the bench for 30 damage while also applying Weakness to benched Pokemon. Double Thread is great for picking off opponent’s Remoraid, and Froakie in the Greninja matchup. Lots of decks will Brigette for a Remoraid, and sometimes be dependent on evolving into Octillery to avoid dead drawing for the game, so if you can get a turn 2 snipe on a Remoraid, sometimes you can kill your opponent’s draw opportunity right away. Sometimes you will be able to use Galvantula to finish off a GX Pokemon that you fell just short of a knock out on with one of your other attackers. Joltik is also a great addition for the deck as it is a free retreat Pokemon. This makes Joltik a great starter as you can have a Xerneas on the bench which you Max Elixir to, and then you can free retreat into the Xerneas. It also is helpful in any turn before you evolve it into Galvantula for giving you something to promote in between turns, helping to lessen how dependent you are on drawing Float Stone. This is another one of our dual type Pokemon, with Bisharp giving us Dark/Metal dual typing. In this deck we can use Bisharp’s Retaliate attack, which honestly isn’t very good, but which becomes strong against Pokemon that it hits for Weakness, such as Alolan Ninetales GX and Gardevoir GX. With a Choice Band, you can OHKO an Alolan Ninetales GX with Bisharp, and if you add a Professor Kukui to the mix you can even hit the damage needed to OHKO a Gardevoir GX. The only other good use for Retaliate is to pick off low HP Pokemon, mostly pre-evolution Pokemon. These typically won’t be active after your opponent takes a knockout (although it is possible after something like Golisopod GX’s Crossing Cut GX), but using Guzma to bring up one of these Pokemon to get back on even prizes is very realistic. In some rare circumstances you can setup a 2HKO on something with Bisharp, but usually if you’re walking down the path of 2HKO’s you’re going to lose the game. With both Galvantula and Bisharp, you have to pick which spots you want to attack with them in and you really have to be intelligent about how you choose to throw them in the fray. When they’re knocked out, you’re losing a dual type, which is -60 damage off your Rainbow Force attacks. Past Rainbow Road decks have played Shaymin EX as their Colorless Pokemon, but with Shaymin EX getting rotated out of the format, we are free to add whatever Colorless Pokemon we want. Oranguru is the best fit for the deck. Instruct adds a nice amount of consistency to the deck, giving it a draw out against N, as well as some extra cards throughout the course of the game when it’s in play. Oranguru can also mix it up as an attacker in this deck, although it takes three Energy, so it’s just as difficult to power up as a Rainbow Force, so Rainbow Force is usually better. It can be useful to power up Oranguru if all your Xerneas in play are already powered up, or if you’re going to run out of Xerneas and need to mix it up with something else to prolong the game. Volcanion EX is in the deck solely because it is the only Basic dual type Pokemon in format. Any dual type gives you +60 damage with Rainbow Force, so one that you don’t need to evolve into is too good not to play in here. You will mostly need to Ultra Ball or draw into Volcanion EX, but against decks playing Brooklet Hill (such as Alolan Ninetales and Volcanion EX), if your opponent puts it into play you can use Brooklet Hill to search out your Volcanion EX because it is a Water/Fire dual type. As we play 4 Ultra Ball, it is good to play a copy of Tapu Lele GX so that we can convert our Ultra Ball into Supporter cards, adding consistency to the deck by increasing the amount of draw or search outs we have available to us. I originally started out with two Tapu Lele GX in the deck, but it’s rarely good to have multiple copies of it in play as it too often would cause you to whiff the damage numbers you need to take OHKO’s with Rainbow Force, so I ended up cutting one for another Supporter. You typically want to stick to using Rainbow Force as your attack throughout a game, but you may find yourself using Energy Drive every now and then. Without VS Seeker in decks any more, it’s amazing how much less of your deck you end up drawing through when you don’t have the potential to use up to 8 Professor Sycamore in a game. This is still the best Supporter in the format and I would be hard pressed to run anything less than 4 in any deck as it’s draw power is in a league of its own in this format. Like Professor Sycamore you will want to max out your N so that you see i more often in the situations where you will want to disrupt your opponent’s hand. It’s good in the early game as a draw Supporter, and later in the game it can disrupt the opponent. In games where you have Oranguru in play you have a solid draw out to N’s to small hands, so you’re pretty good to repeatedly N the opponent to try to stick them with a bad hand. This is a supplementary Supporter card. It can be very strong on the first turn of the game, drawing you 8 cards. This will typically be a strong play in games where you draw into lots of Pokemon early making it so Brigette doesn’t do much for your setup in this set of games. I would only really make this play if I opened Lillie and would try to avoid using Wonder Tag to search it out if you have some other draw Supporter in hand. The only situation where I could see myself using Wonder Tag to find it is in a game where you don’t have any other draw Supporter. In the late game, while Lillie isn’t nearly as good as Professor Sycamore, it does give us another out to draw out of late game N’s. Professor Kukui is primarily in the deck to allow a Bisharp with Choice Band to OHKO a Gardevoir GX. It can of course be useful in other matchups for getting Rainbow Force’s damage output up, but it’s really in there for that Bisharp play against what is expected to be the top deck of next format. If Gardevoir GX starts seeing less play then I would cut these for more Lillie to improve the general draw of the deck. Like many other decks, Brigette is your ideal turn 1 Supporter card. Games where you start with it are of course the best, but it’s always a Wonder Tag away from being used on turn 1. What you get with Brigette will greatly vary from game to game, based on what you start, and what else you already have in hand. Generally you will want to have 2 Xerneas in play after your initial Brigette, and then at least one of a pre-evolution of one of your dual type Pokemon. Which dual type you prioritize will also depend on matchup. If you’re playing against Alolan Ninetales, for example, you will prioritize Pawniard so you can threaten attacking them with a Bisharp. If you started a large amount of Basic Pokemon in your opening hand, it can make sense to go for a Professor Sycamore or Lillie on the first turn of the game instead of Brigette, as Brigette’s effect won’t be very strong. With Float Stone and a free retreater in Joltik in the deck, it’s very easy to not be disrupted by Guzma’s switching effect. It also works well for getting a high retreat Pokemon like Volcanion EX out of the active position. Having a gust effect is still very strong for decks, so Guzma is a staple inclusion in decks right now. It seems that 3 Guzma is the correct amount of Guzma for almost every deck. At four I was seeing them just a little bit too often, while with three I see it about the right amount. This deck in particular isn’t overly reliant on Guzma as it can OHKO anything the opponent puts in front of you. Rainbow Force is a two attachment attack, so we play Max Elixir to help power it up in a single turn. With 9 Energy in the list, you will hit them most of the time, it’s roughly equal to the Yveltal EX/Garbodor decks from last season in this regard, but it’s much less consistent at hitting these then something like a Waterbox or Turbo Darkrai deck is. It just isn’t possible to put more Energy in to make this more consistent while fitting everything else you need into the deck. Super Rod is the best recovery card for this deck because it gets back both Pokemon and Energy. Getting Energy back can be very important in raising the probabilities for your late game Max Elixir. Your Double Colorless Energy are some of your most precious resources in this deck. When attacking with a Bisharp, it’s usually best to attack with a DCE so you can pay its two retreat cost afterwards. Tapu Lele GX, Oranguru, and of course Xerneas are all fueld on DCE to pull off their attacks. As you will always be wanting to see DCE’s, Special Charge is in the deck to get them back so they’re always in the deck when you will need them. Choice Band is integral for hitting the damage numbers you need with Rainbow Force. While you technically can OHKO everything without Choice Band with this deck, it’s very unlikely that you will have all three dual type Pokemon in play at the same time, usually you get around two, and in the early turns you may only have one or none. Choice Band’s +30 damage makes it so much easier to hit the big damage numbers you need for OHKO’s, so it’s maxed out. It also is important for Bisharp hitting OHKO damage against Alolan Ninetales GX, and for allowing it to OHKO a Gardevoir GX if you also have the Professor Kukui. This is the chosen Switching effect for the deck. I think this is better than Escape Rope or Switch for a few reasons. First, upon play it doesn’t go in the discard pile, so it’s better against Garbodor decks. Special Conditions also aren’t a big part of this format right now, so you don’t need a hard Switching effect to reset those, and Guzma already provides an option for getting around that for this deck. Lastly, it can have a prolonged effect beyond one turn. If you attach a Float Stone to a Volcanion EX, for example, unless it gets removed by a Field Blower it will be there later in the game allowing you to promote Volcanion EX to retreat it after a knockout or Guzma. I had this in the list for a long time, but it ended up becoming a third Float Stone in my final list. I didn’t find its effect to be too great for this deck. You can power through anything with a Fighting Fury Belt attached with Rainbow Force already, and removing Choice Band or Float Stones rarely matter. There also isn’t a lot of Stadium Cards being played. The primary one is Brooklet Hill, which lets you search out your Volcanion EX without playing any cards, so that one isn’t even bad for you to have in play. If Parallel City starts seeing play to counter Rainbow Road, I don’t think Field Blower will matter at all, just the act of playing the Parallel City is probably enough to beat this deck with most other decks. This is another option for the deck to play, and something I might try to find some space for in a future revision of this deck. Not only can it act as a “5th” Xerneas, helping lessen the need to hit the Super Rod in some game situations, but perhaps more importantly is it can copy Tapu Lele GX’s Energy Drive attack, and use it as a non-EX. This can be a great attack to setup a 2HKO in some game situations, but it’s not that good actually using it with Tapu Lele GX because it gives up two prizes when it’s knocked out, and most decks in this format are built around the OHKO. This is another dual type Pokemon. The biggest thing working against playing this one is that it has overlap with Pokemon you’re already running, Grass with Galvantula and Fire with Volcanion EX. It is a notable attacker, as it can be used as an attacker against Metagross GX decks and it can OHKO. However, because of the overlap with existing types in the deck, it’s not worth running it. This can be used to give Xerneas an HP boost, making it more difficult to knockout. In the current meta, the big matchup where this would be helpful in is against Golisopod GX variants. Golisopod GX hits that perfect 120 damage to OHKO a Xerneas, so BREAK evolving would prevent a OHKO unless they have the Energy to use their GX attack. I think this is the only matchup where it’s very meaningful in, however, so I don’t think it’s worth an inclusion in the current meta. If you know people are going to bring Greninja to your local League Cup, I would slip a copy of Giratina into the deck. This forces them to 2HKO each Xerneas that you have, which essentially means that they have no chance of winning if you play this card. I’m not sure if there is a good way to actually pull this off with the deck, but if you could get by with only having one bench slot devoted to this, you could theoretically build a Rainbow Road list that uses Secret Spring as its Energy Acceleration. I hadn’t thought about this, but I heard that some people have fit Po Town into the deck. This is a pretty good tech as it places 3 damage counters on stuff every time they evolve, greatly softening them up for you to knock out with Rainbow Force. You would need to get it into play early and hope it doesn’t get removed by a Field Blower, but this would make a lot of your matchups more manageable as it would become much easier to take the knockouts against stuff like Metagross GX which has massive HP. You don’t really care too much about there being damage on your Galvantula or Bisharp either, so it’s pretty much a one sided Stadium option. In many ways, this deck’s matchups don’t feel very important. The main battle with the deck is fighting its own inconsistency. When setup, you can realistically run through everything, if you’re whiffing Max Elixir or not drawing Double Colorless Energy, you will probably lose to most decks. Does the deck have an effective non-EX attacker that OHKO’s Xerneas. How much HP does the deck’s attackers have. How fast does the other deck get setup. Do we hit it for Weakness. This is a pretty favorable matchup. They are a Stage 2 deck, so generally they will take around 3 turns to get fully setup, giving us plenty of time to get setup. We can OHKO a Gardevoir GX with Rainbow Force, and if they take a knockout, we can then use Bisharp’s Retaliate in conjunction with Choice Band and Professor Kukui for a OHKO in some situations. They can attack with Gallade as a non-EX, but this rarely matters as you will typically be knocking out something small like a Diancie, Alolan Vulpix, or Ralts to start out the game. This matchup is pretty solid. Like Gardevoir GX, they take a few turns to get setup, but unlike Garbodor their Pokemon have a lot lower HP making it even easier to OHKO their Pokemon. With Tapu Bulu GX having only 180 HP (or 220 with a Fighting Fury Belt), not that difficult of numbers to reach, you can sometimes have 3 Xerneas in play at the same time in this matchup and still get OHKO’s. They do have Oranguru as a solid non-EX attacker, which can make things interesting, but if they end up taking that direction you can target down a Vikavolt or Tapu Koko promo to get back on even prizes. Their deck doesn’t function without Vikavolt in play, so that will always be there for you to Guzma up to get back on even prizes. Tapu Koko also is a potential attacker in this matchup, but it’s not great. They would need to do a Flying Flip spread and then attack with Electric Ball to get knockouts, and any turn that leaves a Xerneas alive and ready to attack during the next turn typically isn’t a good turn. This is perhaps the hardest matchup of the top decks. Volcanion EX decks have great speed with Kiawe and the non-EX Volcanion allowing it to get off to fast starts. Mini Volcanion is also a very strong non-EX attacker that can trade decently with Xerneas, especially if one gets powered up to use Steam Artillery, as Power Heater will often fall short of a OHKO. You will have plenty of opportunities to pull out wins against Volcanion decks, but they will put Rainbow Road under a stress test and force it to run very well to win. This matchup also tends to be on the tougher side, as Metagross GX forces you to hit for 250 damage. This isn’t impossible, all it takes is two dual types, and then three other Pokemon, along with a Choice Band, but if you whiff the Choice Bands, you’re going to miss the OHKO’s and lose the games where this happens. I think Rainbow Road should win most of the time, but it’s not a big edge for the matchup and you certainly will lose plenty of games because you whiffed your Choice Band and missed knockouts. This matchup is probably slightly favored for Rainbow Road, but the actual games play out close. The big thing in the matchup is that Golisopod GX does exactly the right amount of damage at 120 with First Impression, which puts immense pressure on Rainbow Road. The kicker, of course, is that they’re attacking with a GX Pokemon, so every time you knock one out you get two prizes letting you catch up. You actually don’t use too many Item cards to get setup in most games, so Trashalanche often times will fail to get a OHKO, so Garbodor doesn’t add too much to the matchup in most games. There also are Golisopod GX/Zoroark variants, which are probably slightly unfavorable for you, but from my testing that deck has too many problems with other decks in the format that I would expect it to fade into obscurity in the near future if it’s not already there. This is probably the best matchup you could ask for. There are so many things working in your favor in this matchup. If they try to setup their Octillery, you can Double Thread the Remoraid with Galvantula in the early game to shutoff their early game draw. Alolan Ninetales GX is on the lower side of HP for GX’s, making it easy to knockout with Rainbow Force. Both Alolan Ninetales non-GX and Tapu Koko are impotent attackers in the matchup that don’t OHKO a Xerneas. If they take a knockout, you can also get a OHKO with a Choice Banded Bisharp using its Retaliate attack against an Alolan Ninetales GX. I am not sure what to make of this matchup, as in the games I’ve actually played it has gone in my favor, but I feel that Greninja should be more competitive in the matchup than it’s been in the games I’ve played so far. Some things working in your favor is that you have Double Thread to target Froakie and Remoraid on the bench in the early game, and then you can OHKO anything with Rainbow Force. I guess the reason I’ve been winning most of the time is just because Rainbow Road can end the game in so few turns against Greninja that it doesn’t give Greninja the time it needs to setup properly and catch up in most games. If you expect lots of Greninja to be in your area, it can be a good idea to pack a Giratina promo, as that will pretty much ensure that you win against Greninja as they will cap out at 80 damage against your Xerneas. Almost every non-Golisopod GX Garbodor variant that I’ve played with this deck so far has been very easy to beat. The deck sets up surprisingly well with playing very few Items, so Trashalanche ends up falling short of a OHKO in most games, and then any Drampa GX or other GX’s that they have active are an easy two prizes. As far as these variants are concerned, the primary two that I’ve played against in the new Standard is Drampa GX/Garbodor and then the Drampa GX/Tapu Koko/Necrozma GX/Po Town spread and de-evolve deck. If anyone is playing Parallel City in pretty much any deck you’re probably going to lose. The deck is fragile even when it gets to play a full bench and now that the HP numbers are so much higher in this format, playing Parallel City should successfully prevent Rainbow Force from hitting for the damage you need out of it. I think for the most part, people shouldn’t be playing Parallel City in their decks because I don’t think it is part of optimal deck builds for this format, but if there is enough hysteria over Rainbow Road it could easily find itself into people’s lists. I personally wouldn’t choose to tech against Rainbow Road as it’s already a fragile deck and against average or below average players, they will probably misplay themselves into losses often enough with the deck. Rainbow Road is a solid Tier 2 deck to start out the new season. It has a chance to win against pretty much any matchup, but it also has the chance to lose to anything because of the inherent inconsistency of the deck. If the deck gets too popular or puts up too good of results, it can easily be hated out of the meta with Parallel City, so it’s position in the format is very unstable. Ever considered adding Marshadow GX as a backup for Xerneas? Love the deck building process behind every card and the quantities. I like this a lot. I do like 1 break xerneas just to add some bulk and the attack isn’t terrible in a pinch. Nice to see you pull some success with this!! u dont need kukui to ko a gardy with bisharp. 30 + 60 + 30 is 120 × 2 is 240. a choice band is all that is required. Having played the deck for quite a while, I just can’t see that working. You’ll always need 2 turns setting up a Xerneas, meaning you can’t trade 2 for 1 prizes each turn anymore. Being dependent on your opponent not KOing your Xerneas every other turn doesn’t sound too promising.